Looking for an exciting and educational opportunity for your troop or group? Want to be involved in a worthwhile community service project? Interested in a one-of-a-kind sleep aboard experience? Ready for an experience your troop or group won’t soon forget? If so, come and tour, work and sleep aboard the Icebreaker Mackinaw and experience six decades of maritime history! Once considered one of the most powerful icebreakers in the world, aboard the “Queen of the Great Lakes” you can see the bridge, engine room, Captain’s quarters, mess deck, crew’s quarters and much, much more. 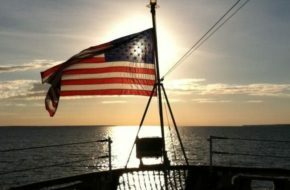 At the Icebreaker Mackinaw Maritime Museum, your troop or group can learn about seamanship, knot tying, signal flags, emergency procedures and participate in raising and lowering the colors on board the ship. 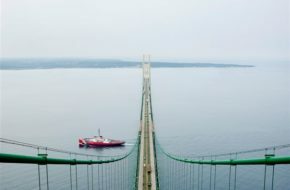 You’ll also be amazed by the incredible view from the Mackinaw where you can see the five mile long Mackinac Bridge; the Upper Peninsula; Mackinac, Round and Bois Blanc Islands; two lighthouses; sailboats, yachts and ferries cruising the Straits of Mackinac; and freighters navigating the shipping channels. Your troop or group can visit the Mackinaw as overnight guests or, if the group wants to provide a very valuable community service and receive a big discount, it can help the Museum maintain the ship in first class condition by cleaning, polishing, painting, landscaping and other activities. A $250 deposit is required to confirm a reservation. Deposit is refundable until 14 days before scheduled visit. 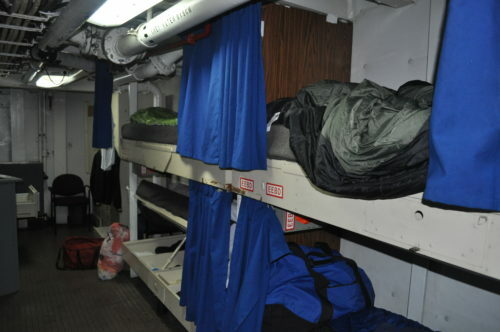 Overnight guests sleep aboard the Mackinaw in the berthing area. The ship does not have running water. Porta-potties are available on the dock. Meals are not provided.